Kolkata formerly known as Calcutta in West Bengal is one of Oldest Metro of India which was once capital of British Ruled India.Earlier majority of Business Tycoons have their registered office in Kolkata. It is situated on the bank of Hooghly (Ganga) River. One side of Hooghly river is known as Howrah, which is also old part of City & other part is Kolkata which is new one. Kolkata is major commercial hub for entire East India. Kolkata played an important role in independence of india with major movements of independence starting from here. It has very rich and artistic culture. It is one of the leading & first amongst all cities with mode of transportation like Tram Transit System & Metro Rail System in India. Rich Heritage values make Kolkata, a must visit place in india. Major Attractions in Kolkata is Tram Transit System, Victoria Memorial Hall (Monday Closed), Birla Temple, Belur Math, Dhakshineswar Kali Temple, Howrah Bridge also known as Rabindra Setu (Oldest Bridge made uniquely), Vidhyasagar Setu (second oldest bridge on Hooghly) & Shopping in the heart of Kolkata at Bada Bazar & in developed area of Park Street. Puri in Orissa is around 532 Kms. from Kolkata & a one night journey from Kolkata. Nearest Airport is Bhubaneshwar, capital of Orissa, it is one hour drive from Puri. Its significance is due to temples all over Puri & Konark & nice beaches around it like Chandrabhaga Beach & Puri Beach. Finest Amongst is Jagannath Puri Temple. It is one of the Char Dham, which is to be covered by every Hindu in his lifetime. Jagannath Puri Temple is one of the best temples of India with shrines of Krishna, Balarama & Shubhadra. (Brothers & Sister). Jagannath Puri's Rathyatra (trip of lord shrines outside temple around the city) is famous all over the world which takes place around July or August. Nearby Attractions are Konark Sun Temple which is also one of the finest & fewest temples of Lord Sun in india with historical importance, Changrabhaga Beach, Raghurajpur Village (an Art Village), Sakshigopal Temple, Chilka Lake, Hirakund Dam & ofcourse capital of Orissa, Bhubaneshwar. This trip was planned for a marriage to be attended in Kolkata, later i added Puri along with it, moreover explored Kolkata as well. Firstly i reached Puri directly from Ahmedabad. Hotel Booking at Puri was made from Online Portal Agoda. After reaching puri in the evening, i made arrangements for the next day for taxi to Jagannath Puri Temple, Konark Sun Temple along with Chandrabhaga Beach, Sakshi Gopal Temple & Raghurajpur Village (An village full of Art). Early next morning we first went to Puri Beach which was next to our hotel, where we pour water of ocean on us. We found Puri Beach risky hence we started our journey to Jagannath Puri Temple. On the way to temple, our taxi driver insisted to hire a panditji (priest) way before reaching Jagannath Temple, because without panditji (priest), travellers are harrassed in the temple. As suggested we hired a panditji (priest) as suggested by our taxi driver & later found it to be wise decision. Apart from Special Darshan Entry Fee about Rs. 50 per person we paid Daxina (Donation) to the Priest on exit. We were lucky to get place of worship next to lord with the help of Panditji (Priest). He also guided us in rest of the Temple premises & different temples inside the premises. He also brought full Kulhad (traditional handleless terracotta cup) of Prasad for us. We eat it in the premises of temple & started for next destination to Konark Sun Temple. Konark Sun Temple is 43 Kms. from Puri, around 45 Minutes of Drive. It is nice monument with heritage structure. After seeing Konark Sun Temple, we went to Chandrabhaga Beach which was nearest. We were once again lucky to find that International Sand Festival & Konark Festival was going on at Chandrabhaga Beach, which was exceptionally an excellent exhibit. Sand Sculptures made from participants around the world from sand of ocean. It seems to be once in a lifetime opportunity for us leaving in Ahmedabad. Chandrabhaga Beach was so clean & looked as one of the best beaches on the east coast of india. 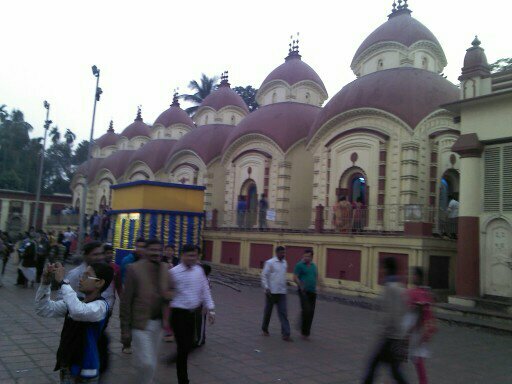 Then we went to Sakshi Gopal Temple bypassing Puri which took around 1 Hour & 30 Minutes from Chandrabhaga Beach. Temple was nice & we didn't wait for longer time, just bow down under the lord & left the premises of the temple. Pandits all over there are hunting for some or other persons to get under their nail for handsome income. Our next destination was Raghurajpur Village, which is an Art Village. Each & Every house in the villages holds artists & arts to be sold & for display. We liked a lot of things over there. All the houses are painted with paintings. They carve a thick leaf of some tree & add some colours to it. It is all about display of Art in your premises. You won't find any carpets or bed sheets printed or weaved in this village. Overall a good place to visit for Art Lovers. Finally the day was over for Puri & Train to Kolkata began. On the last day after Marriage, arrangement for Taxi was made to roam in Kolkata. Our Journey started with viewing Tram Transit System. Although we were not able to take ride in Tram, though it look fantastic. 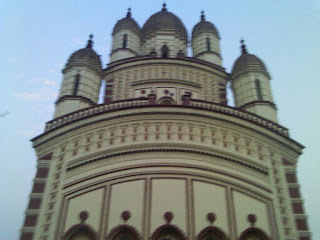 As Birla Temple was near to our Hotel, we first visited Birla Temple. Birla Temple is a nice monument. On the way we visited Park Street, where you would found one of the finest showrooms of Kolkata but rather it is costly street & Ahmedabad too have most probably all the brands found over there.Our next visit was Victoria Memorial Hall (Monday Closed), an exceptionally beautiful monument & could be regarded as landmark of Kolkata. Then we visited Shani Temple situated in Bada Bazar on the bank of river Ganga (Hooghly) & did shopping for garments. We found it reasonable to buy in Bada Bazar. One of the underground market in Bada Bazar was exceptionally good & reasonable. There was a terrible parking space problem hence car was parked far away. After passing through Howrah Bridge, an example of extraordinary iron bridge we reached to Belur Math, it is another extraordinary beautiful monument on the bank of River. Though we didn't found any lord's shrine in the premises. This monument was good enough to be visited once. Finally after passing through Vidhyasagar Setu (similar kind of bridge of iron) we went to Dhakshineswar Kali Temple, it is also beautiful Temple & a must visit for all. Red & Cream coloured temple surrounded with carving all over was fantastic. I personally liked the temple very much. It is also situated on the bank of river with so many temples in front of the main temple with Kali Mata Shrine. It is a well managed temple. This temple was closer to Airport, hence we went directly to airport for the return flight to Ahmedabad in the evening.